BRISBANE coach Wayne Bennett has defended his medical staff against suggestions they flouted the concussion rules during the Broncos’ dramatic 25-24 win over South Sydney. 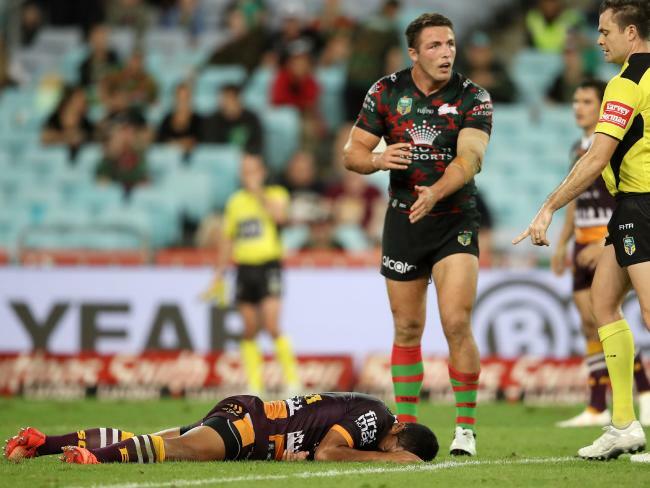 It is understood the Rabbitohs will ask the Broncos to be investigated by the NRL after five-eighth Anthony Milford was taken from the field for a head injury assessment (HIA) on the stroke of halftime. Just moments earlier Milford kicked a penalty goal which proved decisive in the wash up and the question remained whether the No. 6 should have been allowed to take the shot. The Broncos earned the penalty after Milford was hit in a high tackle by Souths skipper Sam Burgess. He was assessed by the club trainers, who cleared him of any signs of concussion. However, as he took the shot at goal, Broncos doctor Peter Hackney reviewed the footage and decided to bring him off for a HIA. “The doctor made that decision, the trainer didn’t make the decision,” Bennett said. “The doctor wanted him off, the trainer thought he was OK to continue, he didn’t see a serious issue. “And Anthony had no symptoms. I spoke to him at halftime. It was just the doctor living by the letter of the law, which is fine.” Milford was assessed at halftime and allowed to return to the field, kicking the winning field goal in a dramatic encounter. The NRL will now review the incident with the handling of concussion one of the most pressing issues facing the game. Milford’s struggles to return to his feet and continue playing before eventually being taken from the field is not a good look for the game, however, the Broncos will be able to argue they followed correct concussion assessment procedures. Despite the Broncos’ claims, many fans and NRL commentators were not impressed at the decision to allow Milford to take the shot at goal. The governing body last month handed out $350,000 worth of fines to St George Illawarra, Gold Coast and Newcastle — of which $200,000 was suspended — for breaches of concussion policy. The Broncos, however, argued that proper procedure was followed and the doctor pulled Milford to be assessed as a precaution. Milford insisted that he had exhibited no signs of concussion and was surprised he was told to come off to be assessed. “I was surprised but there are rules in place for a reason and it’s safety first,” he said. “I was just doing what the medicos told me to do.” He said he was unaffected by Sam Burgess’ tackle and was more shaken up after copping a shoulder charge from George Burgess later in the game. “I was sweet,” he said. Meanwhile, South Sydney coach Michael Maguire is facing the prospect of a $10,000 fine after giving NRL referees both barrels following his side’s dramatic 25-24 loss to Brisbane. The normally controlled Maguire let fly after his side were on the wrong end of several contentious decisions including Milford’s match-winning field goal in the 78th minute. As he caught it, the Broncos five-eighth appeared to bobble the ball before snapping the decisive one-pointer, with Maguire labelling the decision to allow it as “ridiculous”. “Everyone else in this room — did they see that it was or it wasn’t (a knock on)? Make a call because I don’t want to get charged 10 grand,” Maguire said. “Could you explain that to all the Souths fans that continually turn up to our ground, that are passionate around our club. On several occasions Maguire questioned the decisions made by on-field officials and video referees and his comments will come under scrutiny from Rugby League Central in coming days. Last year Sydney Roosters coach Trent Robinson was slugged $40,000 while Canberra coach Ricky Stuart has been fined $125,000 over the course of his career for his outspoken remarks. Maguire held his tongue on several occasions during an extraordinary press conference but made his feelings well known and flirted briefly with claiming his side had been robbed of the opportunity to win the game. The Rabbitohs mentor took issue with Tautau Moga’s 69th minute try, which levelled the scores after Milford was held up. After the Souths defenders prevented Milford from getting over the line, the ball popped out the back of the ruck and Moga scooped it up to score. Maguire argued that when Milford placed the ball on the ground, the tackle was complete and the play was dead. He joked that the referees were playing by rugby union rules and smashed the video referees for allowing it. “We’re spending a lot of money areas in our games, we’ve got to get them right,” Maguire said of the NRL’s $2 million bunker.